Dairy in Human Health and Disease across the Lifespan addresses the contribution of milk to the human diet and health throughout the life span. This comprehensive book is divided into three sections and presents a balanced overview of dairy’s impact on nutrition from infancy to adulthood. 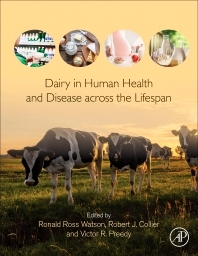 Summaries capture the most salient points of each chapter, and the book provides coverage of dairy as a functional food in health and disease. 20. Does dairy food have effects on cardiovascular disease and cardiometabolic risk? 32. The influence of dairy consumption on the risk of type 2 diabetes, metabolic syndrome and impaired glucose tolerance or insulin resistance: a review of cohort and intervention studies. Robert J. Collier received his B.S. degree in Zoology from Eastern Illinois University in 1969. After service in the Army Medical Corps he obtained his Master’s Degree in Zoology from Eastern Illinois University in 1973 and his Ph.D. in Dairy Science from the University of Illinois in 1976. His dissertation research was on the endocrine regulation of lactogenesis in the dairy cow. In 1976, Dr. Collier accepted an NIH post-doctorate at the Dairy Science Department of Michigan State University in the laboratory of Dr. Allen Tucker. His research was on the regulation of cortisol uptake in mammary tissue of cattle. In September, 1976, Dr. Collier joined the Dairy Science Department at the University of Florida as an Assistant Professor and continued his research on the endocrine regulation of lactation in cattle . . In 1985, Dr. Collier joined the Monsanto Company as a Science Fellow and initiated a discovery program in lactation and growth regulation. Dr. Collier was responsible for all pre-clinical and clinical research in North America required for the commercialization of Bovine Somatotropin as well as research on novel factors regulating growth, development and lactation of domestic animals.. In 1999, Dr. Collier joined the faculty of the Animal Sciences Department, University of Arizona as Professor of Environmental Physiology and later was Head of the Animal Sciences Department. He is presently Professor Environmental Physiology and Director of the Agricultural Research Complex in the Animal Sciences Department. in 2008 was awarded the Land O Lakes Award from the American Dairy Science Association for his contributions to the field of Dairy Research. He has also served on the Biotechnology Advisory Board for the European Economic Community as well as the University of Iowa. He has also served on both the Nutritional Sciences Advisory Committee and the Animal Sciences Advisory Board for the University of Illinois and the College of Life Sciences at Eastern Illinois University. In 2009, Dr. Collier and Dr. Nelson Horseman of the University of Cincinnati cofounded Amelgo Corporation in Covington, Kentucky. Amelgo provides patented discovery and innovation for the dairy industry. Dr. Collier is author or coauthor of 210 journal articles, chapters and reviews, 1 book, 170 abstracts, 60 popular articles and 9 U.S. Patents. His areas of expertise include environmental and lactation physiology, endocrinology and molecular biology.